While safety and health managers do their best to eliminate accident risks in the workplace, from minimizing the potential for falls and other mishaps, the less conspicuous costs incurred from MDS’s, or muscular-skeletal disorders, are causing a significant impact—and employees may not even realize it. Many workers may assume that pains in their shoulder, wrists, neck, back and elbows may be “part of the job” until the increasing severity of these conditions leads to debilitating results. According to the Occupational Safety and Health Administration, OSHA, MDS’s account for more $15 billion a year in worker’s compensation costs. Ergonomic office chair back rests are specifically designed for use with desk chairs and provide the added support to the lumbar, minimizing back strain. Wrist supports position the hands properly and protect the wrists to prevent strain from repetitive motions like mousing. Ergonomic keyboard trays position the arms and wrists at the proper angle and distance to prevent strain from the repetitious actions from daily typing. Monitor risers elevate the computer screen to the proper height to prevent “vulture neck.” Vulture neck may eventually lead to chronic neck and shoulder pain. Get more information on implementing ergonomic practices that reduce MSD’s and keep employees happy and your office productive. Workplace Well-Being Guidelines. Tis the Season for Practicality: Five Unique Gifts That Stay Useful All Year Long. It may seem odd, but laminating can be an obsession. Just talk to any teacher or crafter. 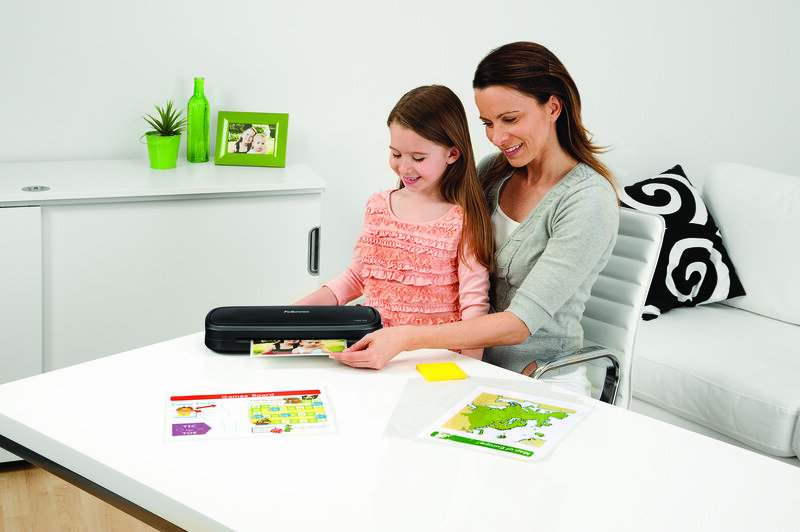 The new laminators from Fellowes feature two unique features. InstaHeat warms up the laminator in a minute or less—a very important feature for those who can’t wait two minutes to get started laminating. The second feature is AutoSense, which automatically adjusts to pouch thickness. This feature is important if you are changing pouches and forget to readjust your machine. If you know someone who loves laminating, check out these options: Laminator Gifts. This essential gift for tablet fans uses suction to create a strong hands-free stand for a tablet. Tablets can be used in landscape or portrait viewing and the special design of the SuctionStand enhances the audio of the tablet. An inexpensive and useful gift is the Laptop LapDesk. Laptops are convenient, but using them on the couch or with your feet propped up on a desk can get uncomfortable. The Laptop LapDesk gives you a comfortable way to use your laptop without cramping your style. We know foot rests are helpful, but wouldn’t it be great if they could also keep your toes toasty? This climate control footrest can provide soothing warmth on cold days, especially after you just tramped through a snowy parking lot. This handy device can also cool your feet on hot days. Either way, your gift recipient will thank you all season long! Need an office stocking stuffer? The Plush Touch Wrist Support gives comforting pillow-like support to anyone who has to use a mouse all day. Compared to simple mouse pads, you will feel the difference in the superior softness of the FoamFusion Technology. Upgrade an associate with the gift of mousing comfort. Elves suffer from ailments and lost productivity associated with long hours spent at a computer workstation. “With a lot of toys, comes a lot of data,” says Santa. “All that information has to be processed.” In the administrative offices of the workshop, elves complained of back and wrist pain, and neck strain, leading to lost productivity and days out of the workshop recovering. Santa implemented company-wide back supports for all admin elves along with keyboard managers to reduce incidents of wrist pain. New monitor risers put screens at the proper height to prevent neck strain. As a global one-night only distributor, Santa found reviewing past performance crucial for future productivity. Storing all past archives off-site lead to long delays in records retrieval, “especially when you are headquartered at the North Pole,” indicates Santa. “It got to the point where we were just stuffing records in stockings and toy chests. That’s no good.” Converting to on-site archiving reduced costs and made records readily available for review.